Frequency Media Group sign dynamic new deal to represent VP Records Reggae Catalogue & Artists in New Zealand & Australia With a company slogan "Miles ahead in Reggae Music" VP Records has been the leading independent Reggae label since the early ʻ90s. Shapeshifter Interviews Happening This Week and Next For Summer Tour This summer Shapeshifter are playing four shows over the Christmas/New Year break, and in an inspired pairing they’re bringing with them reggae legend Horace Andy and his band Dub Asante. Kiwi reggae onstage at the Hawkins Theatre - Papakura PAPAKURA — Upcoming kiwi reggae stars Sons of Zion are set to play the Hawkins Theatre on Saturday 19th March. Salmonella Dub Freak Local EP Salmonella Dub release their new EP Freak Local through Virgin Records on Monday 29 June. Powhiri for Bob Marley AUCKLAND CITY — Bob Marleys sons, Ziggy and Stephen, are to be welcomed to New Zealand in a special powhiri at Auckland Museum on 5 February. NZ tour long awaited for British reggae collective An affinity with New Zealand dub music and the prospect of some sun is making a trip here an eagerly awaited one for British reggae collective Overproof Soundsystem. Gisborne 2007 GISBORNE — Music video of Gisborne 2007, music Skankamila. 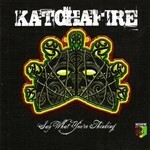 Katchafire add new sounds while staying true to reggae fans Hamilton reggae band Katchafire, on the road to promote their third album, Say What You're Thinking, think the world is ready to take to New Zealand reggae in a big way. UB40 to headline music festival in Rotorua ROTORUA — Reggae heavyweights UB40 will headline a February concert in Rotorua.